Grimaud is a tale of two cities built at opposite ends of the historical spectrum and both of which have their own unique charms. Grimaud is one of the original villages perches of Provence – villages perched high on a hill for reasons of protection and surveillance of the surrounding countryside. Nowadays, the ambient dangers are gone and they make for picture-postcard perfection. There are several of these beautiful apparitions in Provence and Grimaud is one of the most gorgeous and atmospheric examples. A walk up to its feudal castle is worth the effort for the stunning views and the calm to be found there even in the height of summer, but the best thing to do is to get lost in its colourful cobbled streets. Down on the waterfront is Port-Grimaud. Although it looks and feels like a long-lost French cousin of Venice, it is a modern town built on a piece of swamp in the 1960s and then a gateway to the sea was opened, allowing the sea-water to come n. The brainchild of the late French architect François Spoerry, this is a town designed to have a boat mooring outside everyone’s front door and where no two houses are the same. Brigitte Bardot was one of the first investors in this successful scheme that the locals said would never work and she still has a house here. The market here is wonderful and one that feels like a particularly bright old Provençal town. 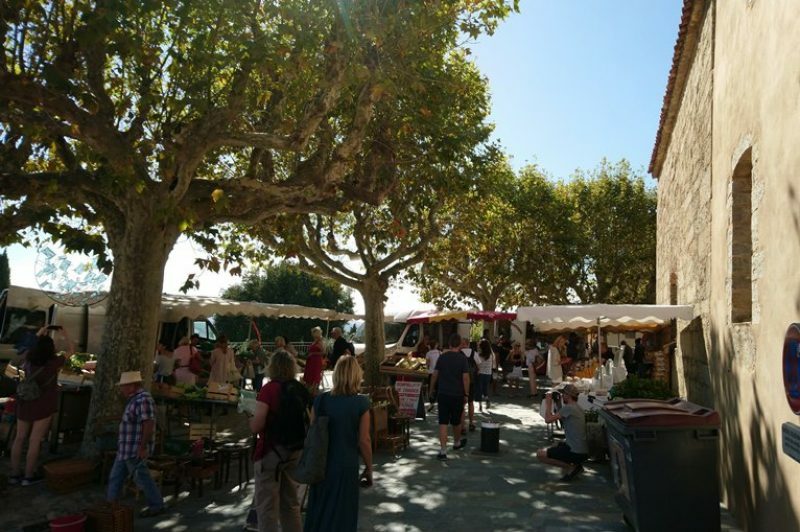 The normal food and local produce market takes place every Thursday and Sunday morningin Grimaud on the timeless Place Vieille from 06:00 until 13:00 and stretching around to the public space in front of the main church the 11th/12th-century Eglise St Michel. Down by the seashore at the very same time, the main weekly market takes place on the Place du Marché. in Port-Grimaud. In addition, there’s the very famous Jas des Roberts Flea Market (Marché des Pouces) that takes place every Sunday from 05:00 to 14:00 in between the two Grimauds off the Route Départementale 14. People come from kilometres around to check out the stupendous amount of wonderful bric-a-brac on sale.